Here are those part #'s and prices Brother!!! Merry Christmas!!! Thanks Don, Some time down the road I'll be needing these. The trans. is still sitting right where we put it the other day. I have made progress on getting ready to get ready to tear into the 82. 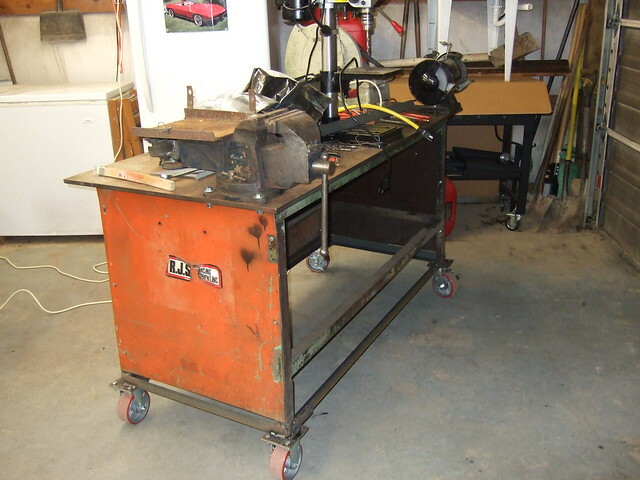 My welding table is back up right and on casters with the sides and back in place. I still have to get the shelf in it for storage. I post a picture later. Great having you and your wife come by for a while. Thanks for the transmission. I got the welding table turned back upright and ready for the casters and called it a day. Thanks too for the pics. Nothing like two grey beards and a shop full of projects. Great to see your little slice of Heaven. Loved to see the lake. Hard work certainly does not go unrewarded. Have yourself a blessed Christmas and festive period. Thanks Rian, have yourself a blessed Christmas as well. Started tearing down the 82 today. Got the hood off, the radiator and fan shroud out and some other little nick nack things. I'll get some pics. of the progress at another time. More of the same just for Don. As you can see the shop is not ready for company but it serves my purpose which is a great place to hang out with my stuff. 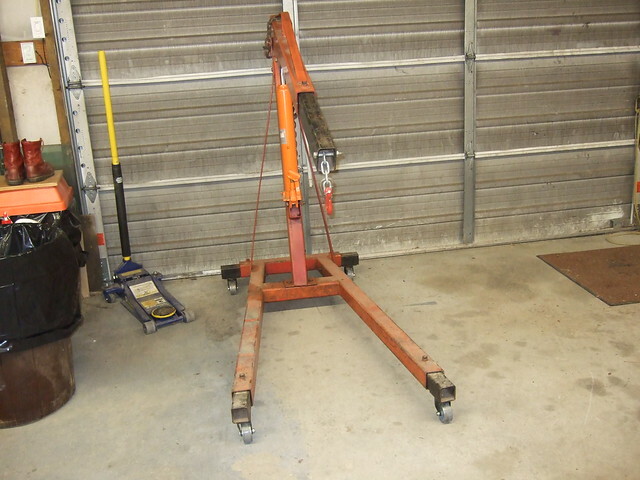 Cherry picker with new casters installed. Jeep on lift with vette parked underneath. Home made drip containment looking like it is working so far. Still need to get the trucks done so the vette won't have to worry about getting dripped on. 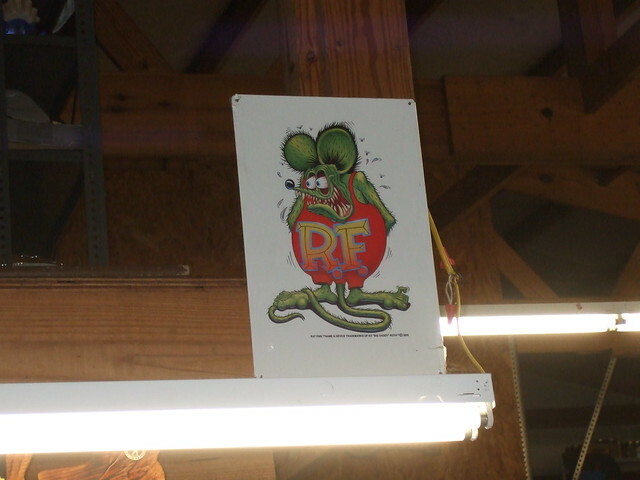 Garage art for Rian aka Grizz. Almost forgot, new to me 5 speed from Don aka Ta2Don. It is close to where it was unloaded last week, but now it is on a dolly, that's progress. I may rename this build, My Shoestring Budget Build or Shade Tree Truck Build. I call my shop "Shade Tree LLC, the LLC stands for Loafer and Liars Club. More progress on tear down and moving stuff around is the shop. Got the core support off, the drive shaft out, power steering pump and alt. removed. Also got the shelf set up for the welding table/mobile work bench project. Found out my car dolley idea did not work so they are in the back of the 62 for now. 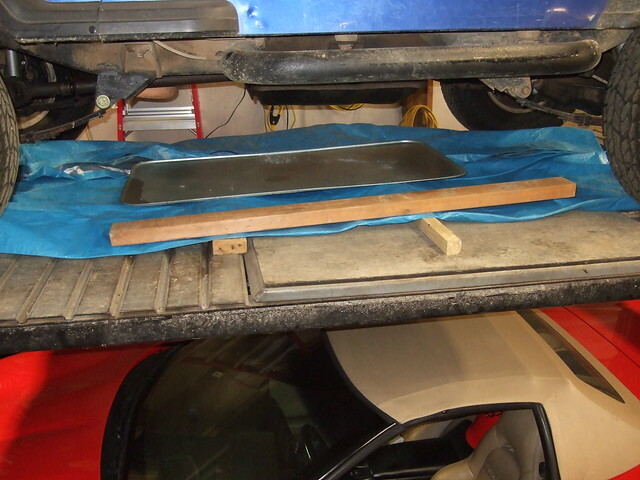 Some shots of the shop with the Jeep on the lift over the vette and the trucks waiting for more attention. Looks Great Brother! Welding table is spot on! More progress. Got the engine out of the 82 on Tuesday and tore it down on Wednesday. Today I tore down another 350 I've had on a stand for over 10 years. It has Brodix heads and is supposed to rebuilt and ready to go but I had some doubts so I took it apart to check it out. It appears to have been rebuilt but there are some issues I want to follow up with the machine shop. The internal parts look new and the valves look great too. No new pictures at this time. A few little things have been taken care of like removing some knick knacks off the 82 that might or might not be used on the 62. General cleaning up and picking up around the shop. Have had to work on my daily driver (99 Z71) this week too. About every six months the throttle starts getting hard to mash and requires cleaning of the throttle body to free it up. Took care of that and cleaned up the lock assy. inside the passenger door that had also quit working. Everything looking and acting good. Then yesterday as I was leaving the bank drive through I heard a squeak that was new. On further inspection it turned out to be the rear u joint. I picked up some new ones from O'reilly's and installed them last night. When I got back from the required road test the low coolant light was on and I could smell coolant. Checked under the hood and found the top rad. hose disconnected from the rad. and coolant all over everything. The hose clamp was slid about half way up the hose. I had replaced the water pump back in July and not put the clamp back in place when I installed the hose. I could not believe that the hose had stayed on this long. How is that for a crazy story? It's hard to believe that the hose had stayed in place without the clamp during all the miles I've driven since installing the water pump. That is the way it goes at the "Shade Tree L.L.C." 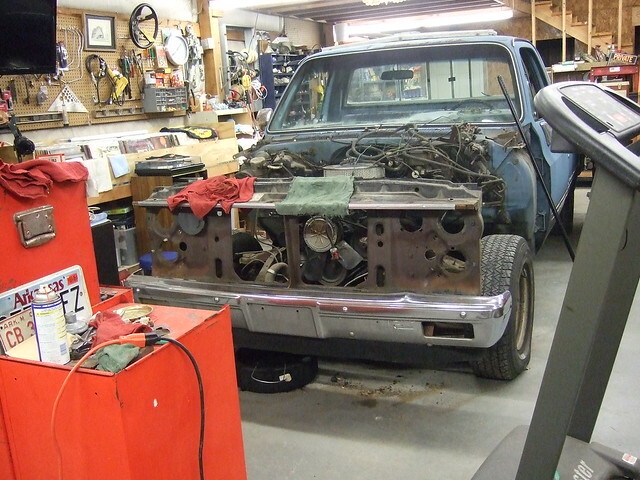 Got the 82 tore down further. 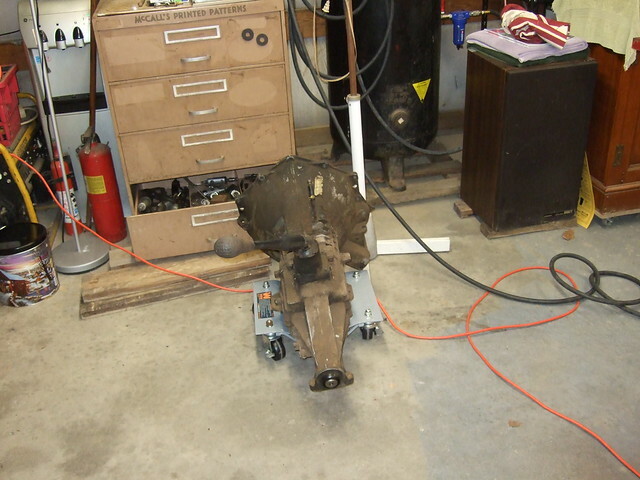 Removed the steering sector, steering column, power brake booster and master cyl. and the biggy got the front cross member with all the suspension and brakes out. Feels like I got a lot done but still have a long, long ways to go. Been following along, like what you've been doing. That hose staying on for so long is serious crazy luck. The progress is going slow. I could not figure how to move the 82 with the cross member removed. So I put it back in place using a couple of it's bolts and the front wheels. I could move it with my jeep and come a long onto the lift. Moved everything around and got the 82 up on the lift. 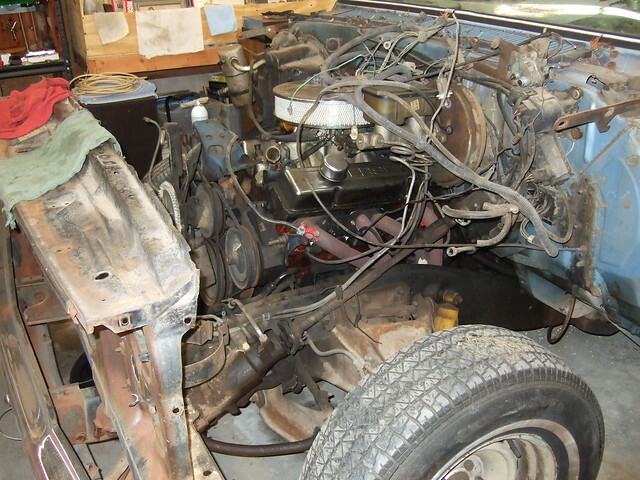 The is 62 where the 82 was the vette is back under the lift and the jeep now easier to get to and use down on the shop floor. Now ready to take the 62 apart and start the upgrades/updates. The 62 is being taken apart very slowly due to rust. The core support mount on the passenger side under the battery was a bear as was the bumper. Yesterday morning was spent in the kitchen replacing the water valve on the refrigerator for the ice maker and water disp. A trip into town for a 5/16 to 5/16 coupling added more than an hour to that little job. In the end we have ice again and that makes my wife happy so I'm happy too. 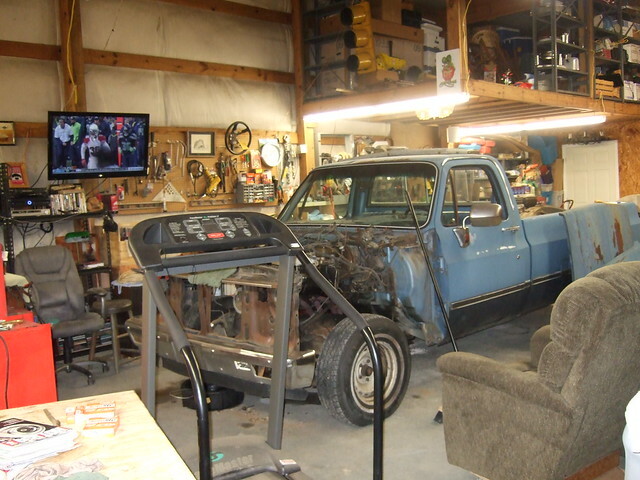 A couple of pictures of said truck progress. Finally got the 235 out of the 62. It has been a long journey up to now with a very long way to go. Next is removing the front suspension and steering sector, cleaning everything and start to rebuild and reassemble everything. Finding a place to store everything until it is needed again takes some planning and a lot of moving stuff around. Check out the hole in the bell housing in the last picture. The tin flywheel cover is all beat up and has a hole knocked in it from the inside out. Bet there was a racket when what ever happened happened. Amazing how sturdy bell housings are. Is that a hydraulic clutch? Yes it is. Seemed to still work pretty good too, what little I drove it before the tear down. Great to hear from you Bomp. just read your build thread and i got to say you are doing it right. Almost everything from the 82 will make the 62 a better truck. the complete cradle will bolt in, power brakes and steering too. there will be a nice stepper in the shop when you're done. And your progress, well, it seems pretty fast to me. Hi Vince, my name's Vince as well....and I too, own a '62! So, I read through your thread with great interest, particularly interested in seeing how that front suspension assembly is going to go in from the '82. I have my whole front clip removed right now to replace the old and tired original 283. 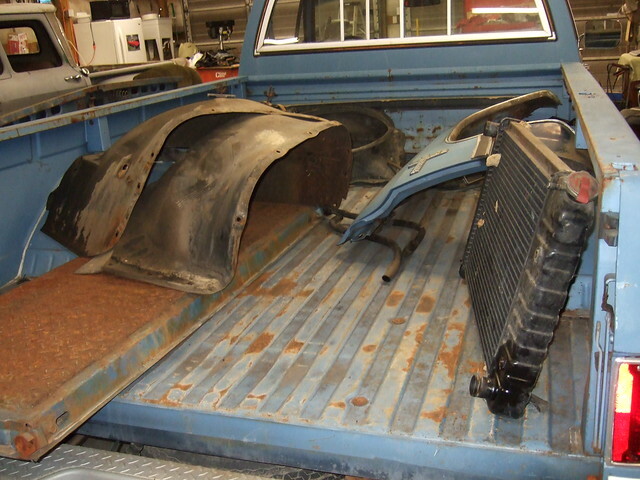 I'm putting a brand new crate 350 in from Jegs. Anyway...keep up the good work, I'll be following along for inspiration. I count any progress as another step forward no matter how small.